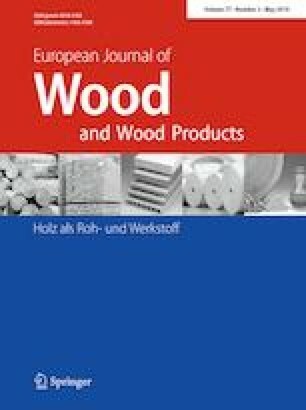 Thermosetting composites were prepared from chemically modified soybean oil and wood flour by compression molding technique. Resins prepared from epoxidized soybean oil (ESO) and softwood powder were used as matrix and reinforcing agent, respectively. ESO was modified initially by methacrylic acid and finally by methacrylic anhydride. For comparison, both neat resin and resin blended with styrene were used in the composite preparation. The probable interaction among the resin, styrene and wood flour was established by Fourier transform infrared spectroscopy, supported by density functional theory calculations. Surface morphology of the composites was evaluated by scanning electron microscope. The flexural strength of composites with styrene-based co-monomer was in the range of 60.47–72.04 MPa, whereas that of composites without styrene was between 25.68 and 37.62 MPa. The tensile strength of styrene-blended composites was varied between 22.15 and 35.87 MPa, whereas the tensile strength was in the range of 13.68–20.48 MPa for styrene-free composites. Styrene-blended composites showed an improvement in mechanical, thermal, water resistance and flame retardant properties over those of composites having no styrene. The higher the amount of methacrylic anhydride in the resin, the higher was the overall improvement in properties of composites.